New Delhi: Sports Authority of India (SAI), which owns five of the 13 stadiums that will be used in the 2010 Commonwealth Games to be held in October in New Delhi, is set to hire an adviser to help it generate income from the venues after the event, a task it’s embarking on with just eight months left to go. The SAI move is in stark contrast to Glasgow, which is holding the 2014 Games and announced its legacy plan on 1 September. Not just that, most of Glasgow’s venues are ready, while Delhi’s stadiums and associated infrastructure are still very much works in progress. The Indian sports body has shortlisted Feedback Ventures, an infrastructure services firm, to draw up a post-Games plan. Another stadium owner, the Delhi Development Authority (DDA), doesn’t see the need for a legacy plan. “We appointed a transaction adviser to advise us on the legacy plan a month ago," said Pravir Krishn, joint secretary and special officer, Commonwealth Games, Sports Authority of India (SAI). “The adviser will decide on a revenue model which will pay for the upkeep of the stadiums after the Games are over." “The idea is to have a legacy plan in place before the Games are over," Gandhi said. Elsewhere, such projects are conceived earlier on in process, so that designs incorporate the requirements before construction begins. A legacy plan needs to be in place before the stadiums are built because it is not possible to recoup the massive investment into developing the stadiums within the 15 days that such an event usually lasts, said Ram Tamara, managing director, Nathan Economic Consulting India Pvt Ltd, a wholly-owned subsidiary of Nathan Associates, Inc. a US-based economic consulting firm. “Having a legacy plan is a relatively new concept even abroad, but in countries such as the US, it is finalised before the stadiums are designed," he said. “A demand analysis is done to gauge the demand for a particular facility at the stadiums after which a hotel, banquet hall or any other facility is included in the stadium design." The transaction adviser will issue tenders to award the maintenance of the stadiums to private concessionaires, Krishn said. “We are looking at private participation for maintenance of the stadiums on a revenue-sharing basis. In two or three months, we will appoint the concessionaires," he said. SAI owns the Jawaharlal Nehru Stadium, the Major Dhyan Chand National Stadium, the Indira Gandhi Indoor Stadium, the Dr Shyama Prasad Mukherjee Swimming Pool Complex (formerly Talkatora Stadium) and the Dr Karni Singh Shooting Range. 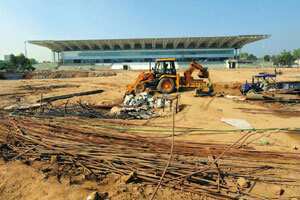 The government has allocated around Rs2,400 crore for renovating the stadiums, of which around Rs1,112 crore has been spent so far, Pratik Prakashbapu Patil, minister of state of youth affairs and sports, told Parliament on 26 November. The legacy plan will include commercial utilization of the stadiums such as leasing them to companies, health clubs and restaurants to generate revenue for maintaining the venues. The stadiums could also be used as a parking facility and for hosting entertainment events, Krishn said. “Our first priority is to offer the sports facilities to sportsmen and for sports events such as the Indian Premier League or international football events," Krishn said. “The remaining space will be given for commercial use." The stadiums owned by other agencies will need to have their own legacy plans, Krishn said. “There cannot be a common legacy plan for all stadiums," he said. “Every stadium owner will have a different legacy plan though we are interacting with everyone on this." DDA does not have a legacy plan for the sports venues it is developing. “We do not have a legacy plan because the two venues that we are developing are within existing stadiums such as the Siri Fort Sports Complex and the Yamuna Sports Complex," a DDA spokesperson said. Other stadium owners include University of Delhi, Jamia Millia Islamia University, All India Tennis Association, Central Reserve Police Force, Delhi Public School, the National Capital Territory of Delhi and the New Delhi Municipal Council. Glasgow’s legacy plan goes beyond generating income and also has public welfare as part of its aim. The idea is to create a healthier Scotland through ‘Active Nation’, the government’s new physical activity programme, with the venues being used as training centres. “The Tollcross Aquatics Centre and the Glasgow Green Centre where the hockey tournament will be held will be converted into national training centres for our sportspeople after the Games," said John Scott, chief executive officer, Glasgow 2014 Organizing Committee. “The training centres will be used for development of our national teams." Some venues such as the Scottish National Arena, which will host the gymnastics and netba@ll events, will be converted into a commercial centre where conferences and events can be held, Scott said. According to Scott, 70% of the sporting venues are ready, four years ahead of the event.